I had been looking off and on for a few years for a way to insert a timestamp into a file in Notepad++, preferably by a hotkey. The no-longer-in-development TextFX plugin frequently comes up in Google searches as one way of doing this, but the plugin doesn’t offer any ability to customize the format of the date or time stamp. I found this article: http://sourceforge.net/p/notepad-plus/discussion/331753/thread/3458d1da that explains, briefly, how to do this using the Python Script plugin. I’ve been curious about Python for awhile, too, so I was willing to give it a shot. The SourceForge project page for Python Script is at http://sourceforge.net/projects/npppythonscript/. So, here’s a quick tutorial on adding a customizable insert datestamp/timestamp macro to Notepad++. Download the Python Script plugin from http://npppythonscript.sourceforge.net/download.shtml and install it. Do not download it from within Notepad++ by clicking Plugins | Plugin Manager | Show Plugin Manager, scrolling down the Available plugins list to Python Script, checking the box and clicking Install, because it just won’t work (and you may get an older version of the plugin). Restart Notepad++ and you’ll find that Python Script has been added to the Plugins menu. To create the script that will insert the timestamp, click Plugins | Python Script | New Script. Enter a filename for the script file you are about to create, like “Time.py”, and click Save. Save the Time.py file to the default location in your user profile. Add the Time.py script to Notepad++ by clicking on Plugins | Python Script | Configuration, highlighting Time.py, clicking the Add button above Menu items, and then clicking OK. But, you probably want to be able to run this as a macro from a keyboard shortcut. Close the Time.py tab and then exit and relaunch Notepad++. Click on Settings | Shortcut Mapper… and choose the Plugin commands tab. The Time script should be listed here somewhere (in my case, it is usually somewhere around number 27). Highlight it, click Modify and assign it to a shortcut. I choose to map my Time script to F5, because this mirrors the timestamp functionality built into Windows notepad.exe, but Notepad++ already uses that keystroke for the Run command. I never use the Run command, so I just remove the shortcut from that command by clicking on Settings | Shortcut Mapper… and choosing the Main menu tab, scrolling down to the Run item and either removing the mapping by changing the shortcut to None or changing it to something else, such as Ctrl+F5. For me, Run was located in the Shortcut mapper under Main menu around number 208. Close the Shortcut Mapper and you’re ready to use your new timestamp hotkey. This entry was posted in IT, Tutorials and tagged coding, scripting on 9 March 2014 by Oliver Baty. I needed to insert a short delay between two processes, so I whipped up a little VBScript that accepts an argument in seconds and then sleeps for that amount of time. If no argument is passed, it sleeps for 3 seconds. It writes to the Application event log before it sleeps and after it wakes. It could be better, sure, but I’m humble about it. It doesn’t validate that the argument is an integer, for example. But it does the trick when used correctly. LogEvent "The sleep.vbs script is sleeping for " & intSeconds & " seconds." LogEvent "The sleep.vbs script is done sleeping." This entry was posted in IT, VBScript and tagged coding, Microsoft, Windows 7 on 20 September 2012 by Oliver Baty. 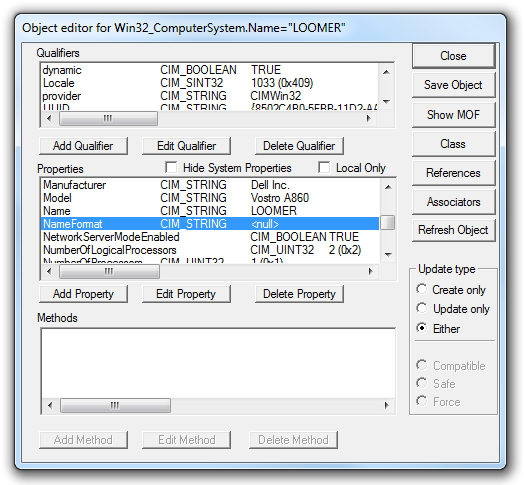 The tool also allows you to browse through the available WMI namespaces and classes on the local computer to find their descriptions, properties, methods, and qualifiers. 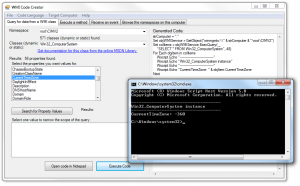 The WMI Code Creator utility can be downloaded from microsoft.com at WMI Code Creator v1.0. This entry was posted in IT, Microsoft, Nonsense and tagged application, coding, Microsoft, troubleshooting, Windows 7, Windows 8.1 on 13 August 2012 by Oliver Baty. In the example, http://alephstudios.com acts as the corporate intranet site that is not accessible from outside the company’s network, and //ardamis.com acts as the publicly accessible site, which can be accessed both from within and outside the corporate network. Setting up an intranet detection/redirection page as the browser’s home page allows IT to display an intranet page while the device is on the network and an Internet page when the device is off the network. This entry was posted in IT, Nonsense, Web Site Dev and tagged coding, network on 4 April 2012 by Oliver Baty. In our corporate environment, our Windows 7 workstations can be powered off or restarted remotely in order to deploy updates, patches, or new software. For those of us running virtual machines in VMware Workstation, this means a running guest operating system would experience an abrupt power-off as the host machine is reset. At the very minimum, this causes the ‘Windows was not shut down properly’ message to appear when the guest OS is powered on, and it may cause serious problems with the integrity of the guest OS or the virtual machine files. I wanted to improve the situation through the use of shutdown/logoff and startup/logon scripts on the host and the vmrun command line utility that ships with VMware Workstation and VMware Server, and I had three goals in mind. 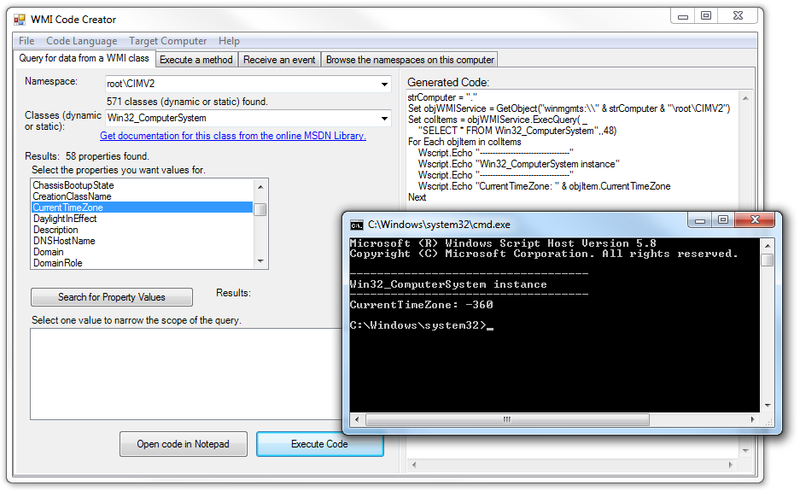 The VBScripts are written for use on a 64-bit Windows 7 host. I soon ran into a problem when trying to use Local Group Policy to deploy the shutdown/logoff script on my Windows 7 host. The order of events is such that the shutdown/logoff process is halted by the still-running vmware.exe process (the VMware Workstation UI). I’ve added some notes about this behavior to the bottom of the post, but I have not yet solved this problem. If the network adapter in the guest OS is not reconnected upon resuming from suspend (in Windows, this can be resolved with ipconfig /renew), it may be that the VMware Tools scripts are not running at start up/resume. Disconnecting from the network is a normal process when the VM receives a suspend command with a soft parameter. I have found that I can ensure that the network adapter is reconnected upon resuming by changing the Power Options for the VM to use “Start Up Guest” instead of “Power On”. This is what I came up with for the shutdown/logoff script. strFileName = TEMP & "\vms.txt"
'Compare the first line in the file to the text "Total running VMs:"
strRunCmd = """C:\Program Files (x86)\VMware\VMware Workstation\vmrun.exe"" -T ws suspend """ & textLine & """ soft"
Suspends a virtual machine (.vmx file) or team (.vmtm) without shutting down, so local work can resume later. The soft option suspends the guest after running system scripts. On Windows guests, these scripts release the IP address. On Linux guests, the scripts suspend networking. The hard option suspends the guest without running the scripts. The default is to use the powerType value specified in the .vmx file, if present. To resume virtual machine operation after suspend, use the start command. On Windows, the IP address is retrieved. On Linux, networking is restarted. This is the startup/logo script that compliments the shutdown/logoff script. 'Compare the first line in the file to the text "Total running VMs: 0"
This script starts/resumes the virtual machine and launches the Workstation user interface. Using Group Policy shutdown/logoff scripts seemed a natural way to power off and resume the virtual machines, but there is a timing problem that prevents this from working as desired. Instead of running any logoff scripts immediately when the user chooses to log off, Windows first tries to close any open applications by ending running processes. When it encounters vmware.exe, which is the VMware Workstation GUI, it pauses the log off process and asks the user whether the log off should force the applications to close, or if the log off should be cancelled. On Windows 7, the screen will dim and the programs that are preventing Windows from logging off the user or shutting down are listed. 1 virtual machine is in use. To close the program that is preventing Windows from logging off, click Cancel, and then close the program. As pointed out on the vmware.com community forums, this only happens when the Workstation UI process is running at the time. We don’t support running Workstation a service. I assume you’re using some third-party tool for that? Anyway, that error only appears if the Workstation UI is running when you try to log off. 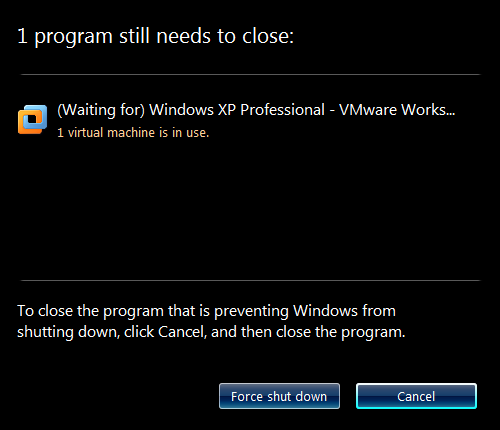 If you kill the UI process (vmware.exe) and let the VM run in the background, you shouldn’t get that. Alternatively you could try running VMware Player instead of VMware Workstation a service. Quitting the Workstation process and allowing the scripts to close out the actual VMs seemed like an acceptable compromise. It still required some user interaction on the host to prepare the guest to be powered off, but I figured that there may be ways to end the Workstation UI programatically prior to the logoff. You can set a virtual machine that is powered on to continue running in the background when you close a virtual machine or team tab, or when you exit Workstation. You can still interact with it through VNC or another service. From the VMware Workstation menu bar, choose Edit > Preferences. On the Workspace tab, select Keep VMs running after Workstation closes and click OK.
VMware Player is not built to run as a service. However, there are different discussions and possible solutions using srvany.exe. If you google for site:vmware.com srvany player you will find some interesting posts for this issue. I followed through on this suggestion, and while it didn’t solve my problem, I’m including some detail here in the hopes that it will further someone else’s exploration. The Windows Server 2003 Resource Kit Tools are not officially supported on Windows 7, and in fact the installer will cause the Program Compatibility Assistant to warn that “This program has known compatibility issues”, but my observations seems to support other people’s reports that they work fine. You should now be able to start the vmplayer service (or whatever you chose to name it) from the Services snap-in. But, we’re still not home free. This doesn’t magically allow any instance of VMware Player to persist through a user logoff (which is really what I was hoping to get). In first case the VM starts after a user is logged in – the VM is visible and you can interact with it but you can NOT log off. It use process vmplayer.exe plus vmware-vmx.exe. What I need is the best of both worlds: a VMware GUI environment, be it Workstation or Player, that is able to load a VM when a user logs into the host, and at the same time is able to keep the VM running while that user logs off. Ultimately, I’m left with the same feelings as expressed toward the end of the thread at http://communities.vmware.com/message/1402590: why should useful and highly sought-after functionality that is present in the free but no-longer-actively developed Server product be absent from the non-free and actively developed Workstation product? The answer, if there is one, may be that VMware doesn’t want to get involved. One of the nastier corner cases is, what happens if there is a failure suspending the VM? Do we decide the user really wanted to log off and forcibly kill the VM, or do we veto the log-off and go back to the user for input (which, if you are using a laptop, means closing the lid leaves the VM running and kills the battery)? What if the VM process crashes during this – who initiates the log-off then? What if the VM is busy doing something expensive (like disk consolidation) and cannot suspend? Getting involved in the log-off path is, realistically, just a mess of bugs. As with pretty much anything I do, this is far from finished. I’m not ready to give up on the goal of using scripts to start and suspend VMs without any user interaction. But it seems that it’s going to be much more difficult than one might reasonably expect. As for the scripts themselves, I’m slightly bothered by the empty command prompt window that is opened momentarily by objShell.Exec. I’m not sure that I like saving the list of running VMs to %TEMP%, where it may be deleted by other processes that clean that location at login/logout. But they are a good start, and they seem to serve their purpose. This entry was posted in IT, Microsoft, VBScript and tagged coding, Microsoft, programming, vmware, Windows 7 on 8 March 2012 by Oliver Baty. In the VBScript example below, I’m using the Icacls.exe utility to assign modify permissions to the D:\Test folder for the user Oliver on the LOOMER domain (or local machine). The script includes as comments some good resources on the subject. Wscript.Echo "Error: folder " & strFolder & " does not exist"
This script is a work-in-progress. To be considered complete, I want it to be able to create multiple directories and assign them permissions. For extra credit, I want it to be able to accept as input a list of usernames from a text file and iterate through them, creating folders where necessary and assigning them permissions. This entry was posted in IT, Microsoft, VBScript and tagged coding, Microsoft, network, security, Windows 7 on 12 February 2012 by Oliver Baty. As part of a migration from Windows XP to Windows 7, I was asked to come up with a way to export the network printers installed on the XP machines such that they could be reinstalled on the Windows 7 machines. We did not want to capture local printers (printers installed via TCP/IP or connected via USB) or virtual printers (like the Adobe PDF virtual printer or the Microsoft XPS Document Writer). I thought that migrating the printers was less attractive because the source machines are 32-bit Windows XP but the destination machines are 64-bit Windows 7 and the drivers are therefore different. There are a number of ways to export print queues, printer settings, and printer ports, but for my purposes, I decided that all I wanted was to determine the name of each printer (eg. : \\SERVER\Printer) on the XP machine, export that to a text file on a network share, and then run PrintUI.exe /ga on the Windows 7 machine, looping through the lines from the text file as input. As an added benefit, I’m also exporting the name of the default printer so that it can be set programatically in the new environment. The code is a work in progress, but I hope it helps get your started. Here are the scripts I’ve pieced together. The exportPrinters.vbs script creates two text files in H:\PRINTERS, so adjust your path accordingly. Note that, if your users in Windows 7 are not administrators, you will need to run the script as an administrator (there are a few different ways) or else you’ll get a UAC prompt for each printer installation and the restarting of the print spooler. Again, watch the paths. This is a home-grown script for my specific environment. 'runas /profile /user:[username]\[password] "cscript.exe \"F:\Printer Driver Research\Automation\printers-import.vbs"\"
'Run As causes the script to run as though it's located in the same directory as "%SystemRoot%\System32\WScript.exe"
'		strRunCmd = "rundll32 printui.dll,PrintUIEntry /ga /c\\" & strComputer & " /n" & strLine & ""
strRunCmd = """printui.exe"" /ga /q /c\\" & strComputer & " /n" & strLine & ""
WshShell.LogEvent 0, "User: " & strName & " - Event: attempted to install printer " & strLine & " with [" & strRunCmd & "] (success unknown)"
Finally, we want to set the default printer. The printer will have to already exist (obviously). If you’ve just fired off the printui.exe /ga command to install the printer, it won’t be available until the print spooler is restarted. So wait a minute or two before running the script.
' strRunCmd = "rundll32 printui.dll,PrintUIEntry /y /c\\" & strComputer & " /n" & strLine & ""
strRunCmd = """printui.exe"" /y /c \" & strComputer & " /n """ & strLine & """"
As the migration proceeds, I’ll come back and tweak the scripts. Please feel free to leave comments and suggestions. Thanks go to Rob van der Woude for his terrific Command Line Printer Control page, as well as many others. This entry was posted in Microsoft, Projects, VBScript and tagged application, coding, Microsoft, network, Windows 7 on 11 February 2012 by Oliver Baty. For a recent project, I needed to create a form that would perform a look up of people names in a MySQL database, but I wanted to use a single input field. To make it easy on the users of the form, I wanted the input field to accept names in either “Firstname Lastname” or “Lastname, Firstname” format, and I wanted it to autocomplete matches as the users typed, including when they typed both names separated by a space or a comma followed by a space. The Ajax lookup was quick work with jQuery UI’s Autocomplete widget. The harder part was figuring out the most simple table structure and an appropriate SQL query. // The jQuery UI Autocomplete widget passes the user input as a value for the parameter "name"
This was effective, accurate, and pretty fast, but the addition of columns bothered me and I didn’t like that I needed to run a process to generate those pre-formatted fields each time a record was added to the table (or if a change was made to an existing record). One possible alternative was to watch the input and match either lastname or firstname until the user entered a comma or a space, then explode the string on the comma or space and search more precisely. Once a comma or a space was encountered, I felt pretty sure that I would be able to accurately determine which part of the input was the first name and which was the last name. But this had that same inefficient, clunky bad-code-smell as the extra columns. (Explode is one of those functions that I try to avoid using.) Writing lots of extra PHP didn’t seem necessary or right. I’m much more comfortable with PHP than with MySQL queries, but I realize that one can do some amazing things within the SQL query, and that it’s probably faster to use SQL to perform some functions. 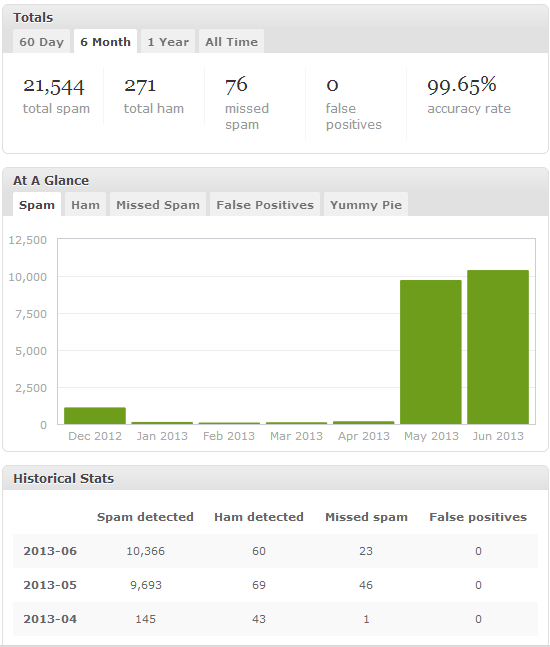 So, I decided that I’d try to work up a query that solved my problem, rather than write more lines of PHP. I Googled around for a bit and settled on using CONCAT_WS to concatenate the first names and last names into a single string be matched, but found it a bit confusing to work with. I kept trying to use it to create an alias, “lastfirst”, and then use the alias in the WHERE clause, which doesn’t work, or I was getting the literal column names back instead of the values. Eventually, I hit upon the correct usage. The first instance of CONCAT_WS isn’t needed for the lookup. The first instance allows me to order the results alphabetically and provides me an array key of “lastfirst” with a value of the person’s name already formatted as “Lastname, Firstname”, so I don’t have to do it later with PHP. The lookup comes from the two instances of CONCAT_WS in the WHERE clause. I haven’t done any performance measuring here, but the results of the lookup get back to the user plenty fast enough, if not just as quickly as the method using dedicated columns. The result of the query is output back to the page as JSON-formatted data for use in the jQuery Autocomplete. The end result works exactly as I had hoped. A user of the form is able to type a person’s name in whatever way is comfortable to them, as “Bob Smith” or “Smith, Bob”, and the matches are found either way. The only thing it doesn’t do is output the matches back to the autocompleter in the same format that the user is using. But I can live with that for now.